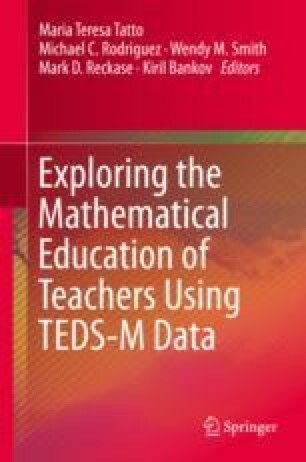 In this study, we conducted secondary analyses using the TEDS-M database to explore future mathematics specialists teachers’ opportunities to learn (OTL) how to teach mathematics. We applied latent class analysis techniques to differentiate among groups of prospective mathematics specialists with potentially different OTL mathematics pedagogy within the United States and Singapore. Within the United States, three subgroups were identified: (a) Comprehensive OTL, (b) Limited OTL, and (c) OTL Mathematics Pedagogy. Within Singapore, four subgroups were identified: (a) Comprehensive OTL, (b) Limited Opportunities to Connect Classroom Learning with Practice, (c) OTL Mathematics Pedagogy, and (d) Basic OTL. Understanding the opportunities different prospective teachers had to learn from and their experiences with different components of instructional practice in university and practicum settings has implications for teacher preparation programs. TEDS-M and the study contained in this chapter were supported by funding provided by a grant from the National Science Foundation Award No. REC – 0514431 (M.T. Tatto, PI). Any opinions, findings, and conclusions or recommendations expressed in this material are those of the author(s) and do not necessarily reflect the views of the National Science Foundation. Lerman, S. (2012). Mapping the effects of policy on mathematics teacher education. Educational Studies in Mathematics. Springer On-Line. https://doi.org/10.1007/s10649-012-9423-9.